This fun little scene features the Candytuft Fairy sitting comfortably and ready to swing into Spring! 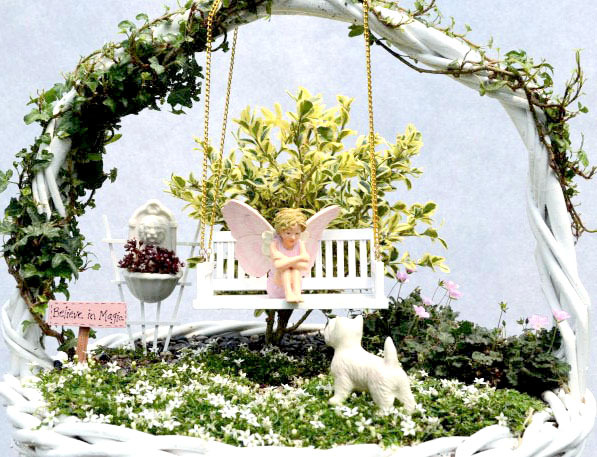 This fun little scene features the Candytuft Fairy sitting comfortably and ready to swing into Spring! When planting in a basket, you should line it with heavy gauge plastic from a trash bag. This will help to keep the basket from rotting and will also keep the soil in. Remember to poke a few holes in the plastic at the bottom so water can drain out. If you like a more natural look skip the plastic and line the inside of the basket with spaghnum moss. Eventually your ground cover will creep in between the crevices and give a beautiful effect to the container. Don’t ignore the handle – plant some teensy ivy and let it curve around the handle. Tie it in place with monofiliment fishing line until it grabs hold on its own. Then hang something from the highest point. It could be a mini lantern, a sign, perhaps a miniature humingbird feeder. Or, as I have done in this garden, a marvelous little, wooden swing. The perfect place for our fairy to relax on a lazy Spring afternoon. Since the basket itself has so much visual impact, I kept the accessories simple. A fairy, the swing, her dog, a planter in the backgroung and a wee painted sign. A fairy garden certain to make you ‘Believe in Magic’, indeed.